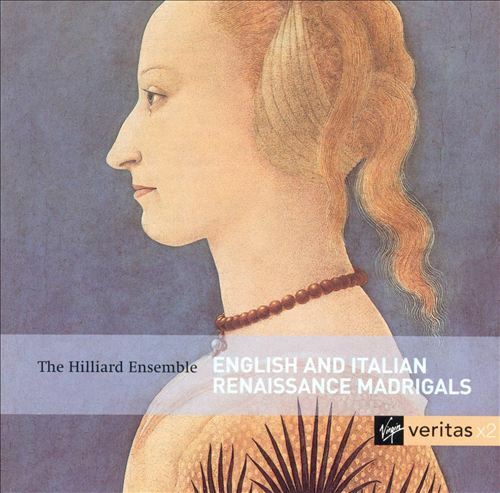 Upon the r equest of some of our listeners, the Hilliard Ensemble’s album entitled English and Italian Renaissance Madrigals (Virgin Veritas, 1999) has been added to the stream. Recently some of CEU Medieval Radio’s listeners have requested more madrigals on the stream on our Facebook fan site. To satisfy this request, CEU Medieval Radio’s music editor Kyra has now scheduled 48 madrigals by the Hilliard Ensemble on the playlist, and more albums will follow. Madrigal is a form of chamber music which was first written and sung in Northern Italy in the 14th century. Although it went out of fashion by the 15th, the madrigal flourished became popular again in the 16th century. The genre eventually achieved international status in the late 16th and early 17th centuries. The origin of the term ‘madrigal’ is uncertain, but it probably comes from the Latin matricale (the Italian for ‘in the mother tongue’). The fourteenth-century madrigal is usually based on a poetic form of two or three stanzas of three lines each, with 7 or 11 syllables per line. The madrigal’s tune is polyphonical and set in two parts. A typical two-stanza madrigal has an AAB form with both stanzas (AA) being sung to the same music, followed by a one- or two-line coda (B), or concluding phrase, the text of which sums up the sense of the poem. The radio’s music repertoire consists of legally purchased albums of pre-1700 music, for the playing of which the Radio Team pays copyright fees to the performers and the record companies. As the Radio Team receives no financial support, the cost of purchasing new albums is covered only by the team members. If you would like to support our work, please donate CEU Medieval Radio legally acquired medieval and renaissance music CDs that you think others would like to hear on the stream too. Our post address is CEU Medieval Radio • Central European University • Nador utca 9, FT floors 4&5, 1051 Budapest, Hungary.